Enter the world of Fantasy Gaming with us here... In our Fantasy Gaming section we have quality Fantasy Board Games, Card Games and the Expansion Sets that go along with the game sets. 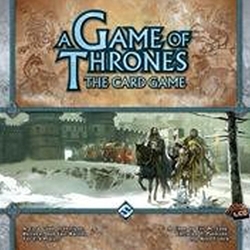 We currently carry A Game of Thrones Games and Lord of the Rings Games. A Game Of Thrones Games are based on the best-selling novel series A Song of Ice and Fire by George R. R. Martin. In Fantasy Gaming, overall, the theme is what is going to make the game stand out. Choose a setting that strikes you as fun. Do you want to be a 1920's detective battling against cosmic evil? Enter the realms of Middle Earth and battle Smaug, Sauron, Orcs, Uruk Hai, and more. Join Bilbo, Frodo, Arwen, Aragorn and their companions in these epic adventure games!